I wake up next to a broken down spaceship, like everyone else who decided to buy No Man’s Sky after years of hype and anticipation. While the opening sequence is the same for everyone, the location isn’t. 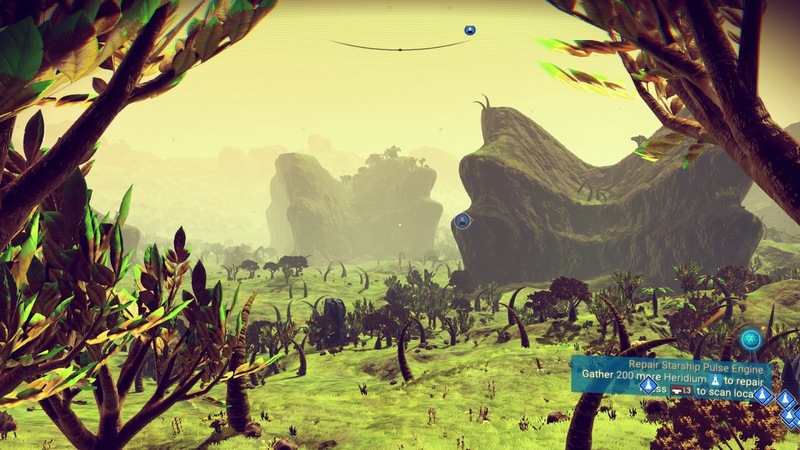 Every single player gets to start on a unique planet, where no other player has ever been before, in a massive procedurally generated universe. It’s this crazy idea — that every single star system, planet, animal, plant, cloud, everything was created by a mathematical super formula, based on some rules given by the developers and designers of Hello Games — that kept me interested since that first trailer at VGX in 2013. I think I’ve read and watched almost every interview with Hello Games founder Sean Murray, who speaks about NMS as if it’s always been the game he wanted to play as a kid. Sometimes I wonder if they randomly decided he should be Hello Games’ “PR guy”, because he can be a little awkward at times, but this game really came straight out of his mind. That’s certainly one of the things I admire in the team at Hello Games. If you’re working with such a small team you are not part of the game, you more or less are the game. Surviving and sticking to your own original ideas and plans in the circumstances NMS has been in is an incredible journey and accomplishment on its own. Very few people get the chance to reach so many people with their creativity, let alone make money with it, especially at this worldwide scale. The only people I can think of are 17th century painters, but they were mostly long gone before the fame came. I think many creators struggle with it at some point: I have an audience. People are following me on Medium or subscribing on YouTube. I now have the duty to make things they like. In a way I think that’s No Man’s Sky’s and Murray’s most important lesson: It’s possible to stay true to yourself and your ideas even if you have a (very large) audience. People started following you because of you and your creativity and ideas in the first place. NMS isn’t for everyone, but apart from sunlight and air what is? And if you are one of many who are not interested in this game, let it and its creation process at least be an inspiration.